Telangana Model School (TSMS) Selection list 7th,8th,9th,10th Classes TS Model School Results 2018 are announced by the Telangana model schools, Hyderabad. The model schools in Hyderabad, Telangana conducted a model school entrance test. This year also, massive number of candidates had participated in this TS Model School Entrance Exam like the previous years. Everyone one were waiting eagerly for their Telangana State Model School (TSMS) entrance exam results. The Government of Telangana has announced the results on their official site. Aspirants can check the details in the official website of TSMS Telangana Government. Telangana Model School (TSMS) 6th, 7th, 8th, 9th, 10th Classes Admissions Online Apply at http://telanganams.cgg.gov.in, 7th Class Admission Test for admission into 7th class and for left over seats in VII to X classes in Telangana State Model Schools, Results Available Now at http://telanganams.cgg.gov.in/. 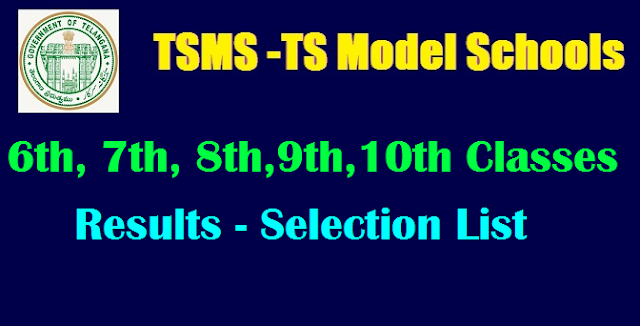 The TSMS exam for clas 6th, 7th, 8th, 9th, 10th were conducted Feb 2018 and TS Model School Results 2018 for class 6th is released in their official site. Other results for class 7th, 8th, 9th, 10th will be released soon. The application started at January 2018 and the payment also started at the same day. The application date ended at February and Payment closed at of February 2018. Go to the link and fill up your particulars. Enter you roll number and date of birth or if any other asked. Click submit and get your TS Model School Results 2018 . TS Official website – telanganams.cgg.gov.in/ . For further details about exam dates, results. recruitments and other updates visit our daily web page at http://www.paatashaala.net/ .